Ahmednagar’s contribution to Maharashtra’s social, cultural and educational development has always been significant. Radio Nagar has committed to instill, encourage, and promote social pride in the citizens of Ahmednagar and to leverage it for the development of the city. The 2nd foundation day of Radio Nagar 90.4, operated by Snehalaya, was commemorated on 13th January, 2013. Radio Nagar has always reviewed and highlighted the social problems, key developments in the city and the concerns of the citizens. Luminaries from various backgrounds such as social, education, and political, have also expressed their views on this channel from time to time. Radio Nagar - The Pride of Marathi Community. To commemorate the foundation day, a social gathering was organized in the Dr Shankar Keshav Adkar Open Auditorium. Many luminaries dedicated to literature, politics, social and cultural arenas ensured their presence for the same. Palak Mantri Mr. Baban Rao Pachpute made it a point to grace the occasion with his presence in spite of the ongoing Khashaba Jadhav wrestling competition, and also gave a wonderful interview to the Radio Nagar team. Canada-based well-known Marathi writer Dr. Vidyullekha Aklujkar mentioned that Radio Nagar, which strives to bring together social enlightenment with entertainment continuously over 18 hours, is the pride of the Marathi-speaking community in Nagar. On the occasion, Mayor Sheela Shinde, Deputy Mayor Geetanjali Kale, Ex-Mayor Sangram Japtap, Ex Nagaradhyaksha Mr. Shankar Rao Ghule, also many luminaries from the field of literature such as Dr Sanjay Kalamkar, Keshav Bhanage, Sunil Raut, Mr. Bhalchandra Balate, Dr. Mukund Devalalikar and many respected writers and poets were present. From the field of education, Dr. Khaserao Shitole, Prof. Jyoti Kulkarni, Mrs. Malati Gore, Mr. Priyadarshan Bandelu graced the occasion, while from the field of arts, theater and sports, Makarand Kher, Mangesh Joshi, Sashikant Najaan, Nileema Bandelu, Deepak Sharma, Rahul Bhingardive, Gajendra Kshirsagar, and from field of broadcasting, Sateesh Kane (editor of Daily Samachar), Bhushan Deshmukh from Daily Divya Marathi, Mr. Lalit Gundecha from Daily Nava Maratha, Senior Reporter Mr. Mahadev Kulkarni, Senior Advocate Mr. Ashok Kothari, Adv. Sham Asava, and Ad Shivaji Karale graced the occasion. Also present on the occasion were Mr. Chandrashekhar Karavande, Brahmaveena exponent Mr. Madhukar Chaudhary, Ornithologist Mr. Balasaheb Kulkarni, famous photographer Mandar Sabale, interior designer Ajay Apurva, vocalist Ashatai Deshpande and many more respected and prominent citizens of Nagar. This radio channel is run by Snehalaya. 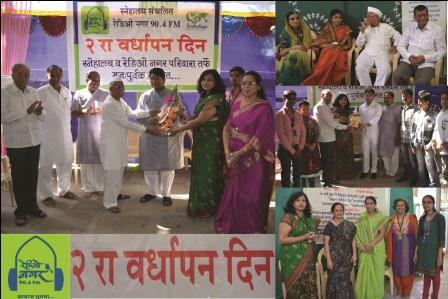 The entire team of Snehalaya, led by president Mr. Suvalal Shingvi (Bapuji), Secretary Mr. Rajeev Gujar, Milind Kulkarni, Rajendra Shukre, Centerhead of Radio Vahini Rupali , Program Manager Prasanna Pathak, Head of Production Dr. Priti Bhombe. Shrenik Shingvi, Chief Advisor Dr. Gopalrao Mirikar exchanged their thoughts with those present.